2013 was a busy year! I made a ton of art and really learned a lot. I was fortunate enough to attend three very different art workshops and I spent most of the year either finishing pieces that I began at those workshops or making art inspired by what I learned. In September I took a great workshop with Katie Pasquini-Masopust and I recently finished some of the work I began there. The first piece is called "Cosmic Duet #1" and consists of two panels that are meant to be hung together. The second piece is titled "Hot Graffiti". I love both of them and love, love, love this technique! Before this workshop I had never painted on canvas before and I love the way it feels and the fact that you can sew it. How awesome to combine all my art loves: painting, collage, and sewing! 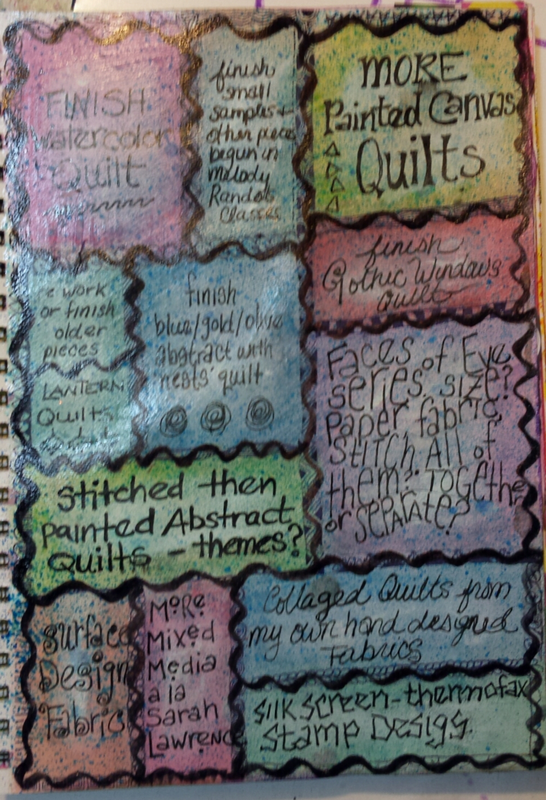 Elements of this technique would apply nicely to paper too, although to be honest, the thing that makes these pieces sing is the quilting, which you could not do on paper. My mind is off and running with ideas for experiments! These are photos I took with my phone camera of the canvases for "Hot Graffiti" prior to cutting them up. Sorry they are a bit blurry. I had never used the camera prior to doing this! Sometimes I feel like a Luddite. LOL!